Hi! 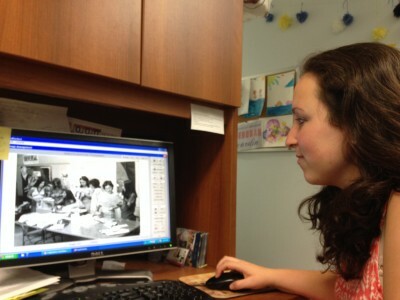 My name is Arielle and I’m working at the Jewish Museum of Maryland this summer as an Education and Programming intern. After two weeks on the job, I can honestly say that I’ve learned way more than I can write. From observing tours, to working with visitors, to learning how to use Past Perfect, to attending meetings, to planning exhibits, this job has been quite a ride. In addition, its also been a lot of fun! I love the work that I’m doing at the museum. Plus, the people that I’m working with make it even more fun and rewarding. The community of staff and volunteers at the museum has been incredibly welcoming. They are so phenomenal at what they do and they are great teachers when it comes to learning how a museum works. 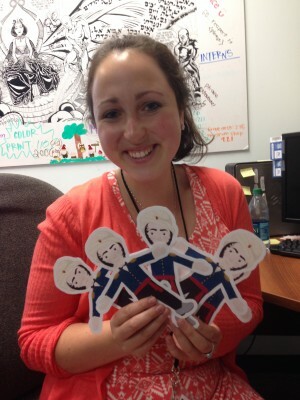 “Intern Wrangler” and Senior Collections Manager Jobi taught all the interns how to handle collections items. 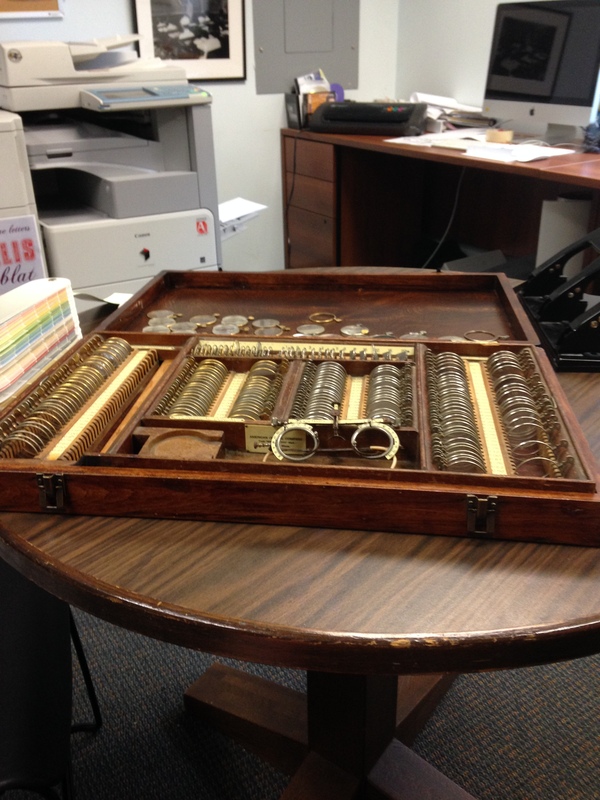 I was fortunate enough to be able to work with this artifact – an eye glass case used by Optometrists back in the day – and prepare it for display. On the job I’ve gotten to play a part in so many awesome upcoming things that will be taking place at the museum both this summer and this fall. After sitting in on several meetings regarding the Electrified Pickle exhibit and helping put together the set of collections items that will be on display, I can honestly say that the exhibit which will be opening on July 13 is going to be amazing! Among other themes, the exhibit deals with the Jewish relationship with technology and how it’s progressed over the years. The topic is very engaging and the collections items we’ve gathered to show on display are fascinating. The exhibit should be very educational and I know we have several exciting programs coming up that will be going along with the exhibit! As an intern I never expected to have such an important say in the planning of an exhibit, but the JMM is unique because I think it really trusts its interns and treats us like members of the staff. From this trust and responsibility, I have loved stepping up to the plate and learning by doing, instead of learning by watching. I have gained so much by attending these exhibition planning meetings and researching artifacts. I can’t wait to help build the exhibit over the next two weeks and watch its success when it opens. In addition to helping plan the “Electrified Pickle”, I have also been given the opportunity to work on projects regarding the upcoming exhibit “The A-Mazing Mendes Cohen” which opens on September 14, and the chance to help organize the museum’s upcoming Holocaust Summer Teacher’s Institute. It has been a very fun and rewarding process doing both of these things and I can’t wait for the rest of the summer to see how much more I learn! So, that all being said, I hope you stop by the museum this upcoming summer to check out the “Electrified Pickle” and come back again in the fall to see “The A-Mazing Mendes Cohen.” I promise you won’t be disappointed! They should be both “Electrifying” and “Ahhh-mazing!” Hehe, get it? So many Mendes, So little time! Be sure to come back in the fall to meet The A-Mazing Mendes Cohen yourself! You can even download your OWN Flat Mendes here or pick one up at the front desk next time you visit the Museum! The Jewish Museum of Maryland is an amazing place and so far I couldn’t be happier spending my summer working as an intern here. 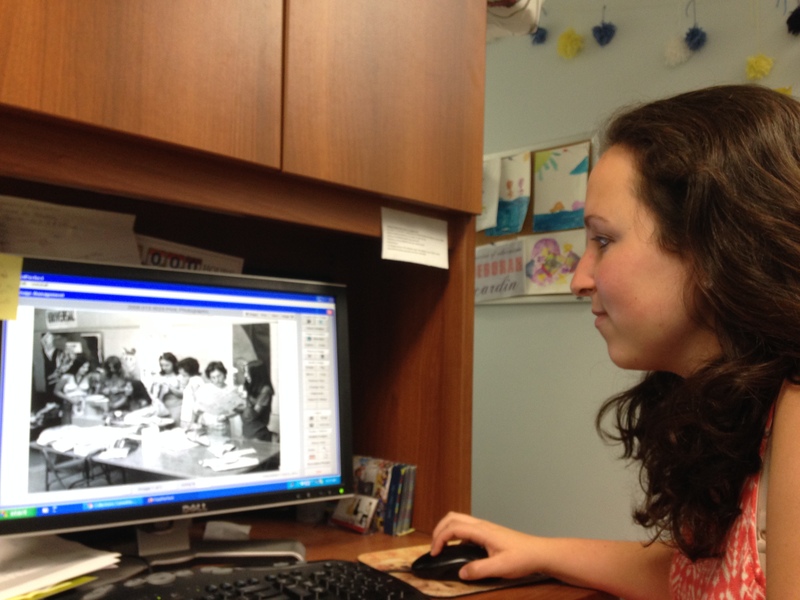 A blog post by Education and Programming Intern Arrielle Kaden. To read more posts by and about JMM interns, click here.